Whether the recipient is an avid botanist, a nature-lover or simply cherishes the peace and tranquillity of beautiful gardens and rolling landscapes, they will simply love a visit to Maleny Botanic Gardens & Bird World. Give an experience you will truly love with a Day Pass to Maleny Botanic Gardens & Bird World. Your gift recipient will be able to enjoy lush, expansive gardens and meet our colourful family of birds. 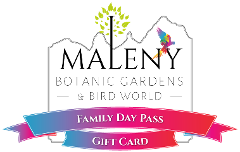 Give an experience the whole family will love with a Day Pass to Maleny Botanic Gardens & Bird World. Your guests will be able to enjoy lush, expansive gardens, meet our colourful family of birds & have an open-air picnic from our café. 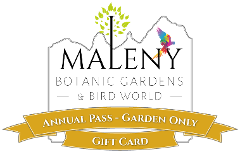 Whether you're an avid botanist, a nature-lover or simply one who cherishes the peace and tranquillity of beautiful gardens and rolling landscapes, you will love our Annual Garden Pass at Maleny Botanic Gardens & Bird World all year round. 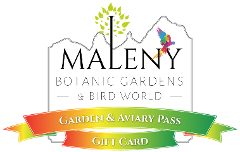 Share the magic of Maleny Botanic Gardens & Bird World all year round with an Annual Garden & Aviary Pass. Visitors will witness the seasons change across the panoramic views and enjoy our wonderful destination time after time!